In December, anglers, fanatically in love with their hobby if their local water bodies covered with ice, take along a spinning rod and travel to other areas where there is unfrozen sections of rivers and lakes in order to catch a pike. Among anglers, there are rumors that in December it happens such a short period, when there is “a Large winter feeding period”, when it eagerly rushes to almost any bait in open water. 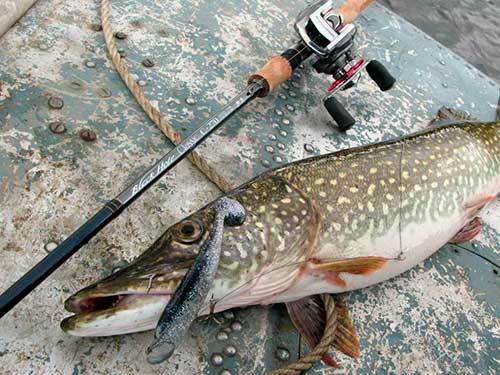 Experienced anglers affirm that hunting with spinning for pike in December can be successful. The spinning in December successfully value on boats and boats deep areas of lakes and rivers. Brings success and the pike fishing in December on the jig from the shore, when the fisherman puts his ship at anchor and starts jigowatt. Effective pulsating wiring: a fisherman makes casting a lure, gives time for her to fall to the bottom is five or six turns of the coil, again pause and again PREROLL five or six turns. The best time of catching of a pike in December, starts from 12 am and ends three hours later. Often, the pike bite better from nine until the hour of the day. In the first month of winter fishing with spinning can be successful and from the shore. It is established that the pike and winter leaving their Parking lot deep, and is suitable to feed in shallow water (this fact is well know fishermen catching pike with ice, they set imitation fish in the reeds). In new places on the river or lake, where pike, the angler will have a lot to go on shore, before you find a place where he can receive the toothy predator. The December search of the pike differs from how it is looking in the warm season and winter fish are still much less active than the summer, therefore more time to sh in places that seem interesting. By the way, we should not forget that wander through the snow-covered Bank of a river or lake in December is not the same as in September, so the fisherman needs to be dressed accordingly warm, but the clothes should be easy. Shoes should be waterproof, warm and, of course, easy. Boots made of porous rubber just have all these properties. To catch a pike in December can be on the same lures spinning that in the warmer months of the year, but many anglers prefer the good old your friends — checked for decades, the oscillating spinners. Experienced fishermen claim that it is better to use a bait of a smaller size because of the pike at this time the belly is already full of eggs, so the predator, earning their living, prefer smaller fish. In December, as in any other month of the year, pike are best caught spinning when the weather is stable, does not occur large variations in atmospheric pressure. Someone says that the pike it is better to have pecked on a clear day someone proves that cloudy days are more profitable, but all agree that in irregular weather the bite is not at all. In January, the fish activity is much lower than in December, however, the fish cease to feed, so it is possible to catch. So many fishing lovers are not willing to give up his Hobbies of fishing for pike on spinning in January, and leave on ice-free waters. 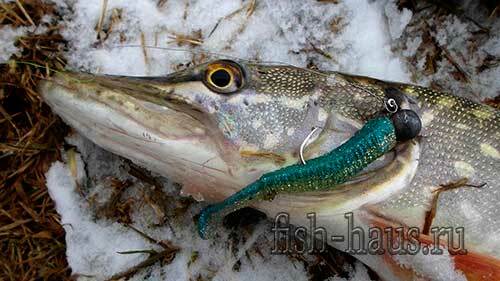 In the middle of winter, many attacks remain without scoring, but sometimes, the spinning can take trophy fish pike. Although in January the toothy predator a lot and does not move over the pond, but still there is such a dependence: in severe frosts it is often fished in deep water at some distance from the shore, and with the beginning of the thaw pike often goes in shallow water, as if rehearsing their future spawning behavior. The fishermen were practicing in January to catch the spinning, in the course of vibrohvost and twisters, but don’t forget the rule that it is not working baits is almost never, today, only caught on the Twister, spoons tomorrow, the day after tomorrow on the turntable, in a day than the predator nor tempt — not a bite. 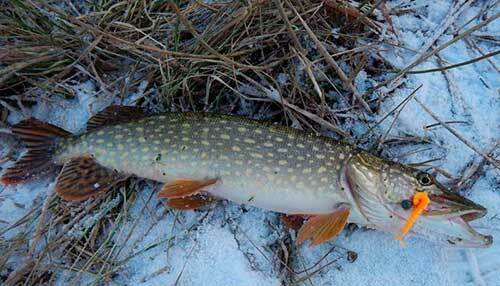 In January, the pike hunts more for small fish, the bait doesn’t have to be large. January the pike is even more “retarded” than in December, so the wiring bait should be very slow, the step is wiring one or two turns spinning reels, the pause can be three, four seconds. It is not necessary to speed up the pace of posting, even if can not stand the nerves from the tremendous number of false casts. The pike fishing on spinning in February differs quite a bit from how it is caught in the previous two winter months. And yet there is a caveat: if current Feb many thaws that in recent years not uncommon, the predator can slowly begin to move to spawning behavior. She already wakes up in the instinct of procreation, she starts to feed more in order to store energy for spawning. In a separate February days Hiking with a spinning rod on a body of water for pike can be very successful. 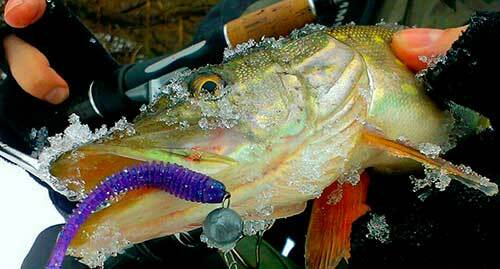 The greatest result will use a small silicone lures in bright colors. Although in February, pike already and wakes up the instinct of procreation, it moves slowly, as you have not gained strength after the winter period. Perhaps that is why the greatest success brings the jig method of fishing, initially suggesting a slow speed wiring. Of course, should be applied to other types of fishing. Luck is always on the side of the fishermen, who like to experiment with baits and methods for their transaction. Given the pre-spawning “mood” pike, it is increasingly possible to detect in shallow areas of rivers and lakes. The most important advice of the fishermen, who decided to continue after the fall season fishing and spinning in the winter, will lie in the fact that he was not going to fish in very severe frosts — health is more expensive pike. In moderate frosts should dress in warm, modern fishing clothes, good on the shelves of the fishing stores are now an abundance of such goods. Do not forget to buy gloves, even at zero temperature hands can keep warm, stop to listen. Boots made of porous rubber will be one of the best options for winter fishing. It is worth to spend money to harsh winter conditions on fishing to feel comfortable. Frost feel the strength of not only fishing but also spinning, and its fittings. The cold reduces the life of rods, reels, and fishing line — it is worth pondering to take on winter fishing the most expensive gear. If your budget prevents you from “littering” money, it is better to take to the shore of winter pond for the budget gear. The main technical problem for anglers catching pike and other predators in the winter, it is freezing the cord, jamming the rings and reel ice. it is possible to use other oils from household items (cosmetics, sunflower oil), but they are inferior in the efficiency of the above substances. If significant frost is necessary to grease many times for fishing, or simply do not get to fish. By the way, no need to take ice fishing spinning rod equipped with too small rings painfully quickly they become clogged with sludge. Winter is better on the spool of a spinning reel braided line, monofilament fishing line though and less frosting, but the braids higher the sensitivity, which is very important, because at this time of year is best to use a jig methods of piloting. The sooner the spinning will feel the bite of pike, the sooner he will react and do the cutting.